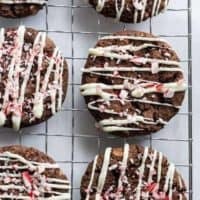 Delectable chocolate cookies are given a festive kick with the addition of espresso powder and peppermint candy canes – they’re the perfect treat for any holiday cookie tray. Well, it’s December 20th and as I sit here typing this blog post, I should be in full-on freak out mode because I have to do all the things. However, I’m strangely calm. I know they’ll get done even if it means being hopped up on coffee, or these Peppermint Mocha Cookies and wrapping presents at 3am. Every single year, I plan on being a little more organized, ya know, just a little bit more prepared, and it never happens. Still, everything does get done – eventually. Now that we have a toddler, things are pretty much more disorganized than ever. Have ya ever tried wrapping gifts near an 11 month old? Fun times I tell ya, especially when said 11 month old’s favorite thing on the planet is paper. I had a ton of cookie recipes on my Christmas must-make list, and truth be told, some were pretty fancy-schmancy. But I decided that the list simply wasn’t going to happen. Instead of stressing out, I’m making a few Christmas cookies that are simple, but absolute crowd-pleasers. 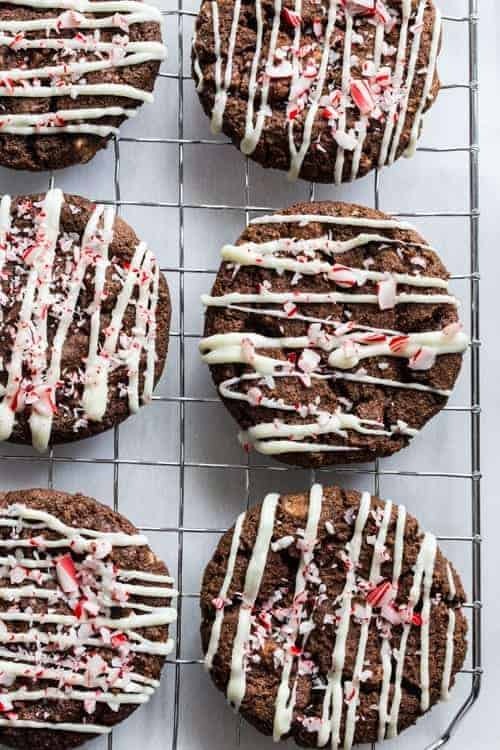 Cookies like these Peppermint Mocha Cookies, plus Peanut Butter Blossoms and Candy Cane Snowballs – they’re simple, they’re delicious, and everyone loves them, making them total wins in my book. If I’m being honest, I even ordered a cookie tray from my aunt’s neighbor. I’d normally be giving myself flack for ordering cookies. (Hello, I call this place MY Baking Addiction!) But this year, I’m totally cool with keeping things simple and easy. Between packing for our big move, traveling, and a super mobile baby, I’m most definitely cutting myself a break this year, and if you’re in a similar situation, you should too. My cookies may not be super fancy and my gifts may lack homemade bows, but guess what – I won’t be nearly as stressed. And let’s be honest no one really cares about the pretty homemade bows except me. What’s really important is the memories we’ll make this year on our baby girl’s first Christmas. Seeing her first bites of Christmas cookie is something to be cherished and savored, right? You only get one first Christmas. Let’s all have a merry one, guys! In the bowl of a stand mixer fitted with the paddle attachment, or in a large bowl with an electric mixer, cream together butter and sugars until smooth. Beat in the eggs one at a time, then stir in the vanilla and espresso. In a medium bowl, whisk together the flour, cocoa, baking soda and salt. Gradually stir the flour mixture into the creamed mixture until just combined. Fold in the cappuccino or chocolate chips. Drop by rounded teaspoonfuls onto ungreased cookie sheets. Bake for 8 to 10 minutes in the preheated oven, until cookies are set. Allow cookies to cool on baking sheet for 5 minutes before removing to a wire rack to cool completely. Once cookies are completely cool, melt candy melts according to package directions. 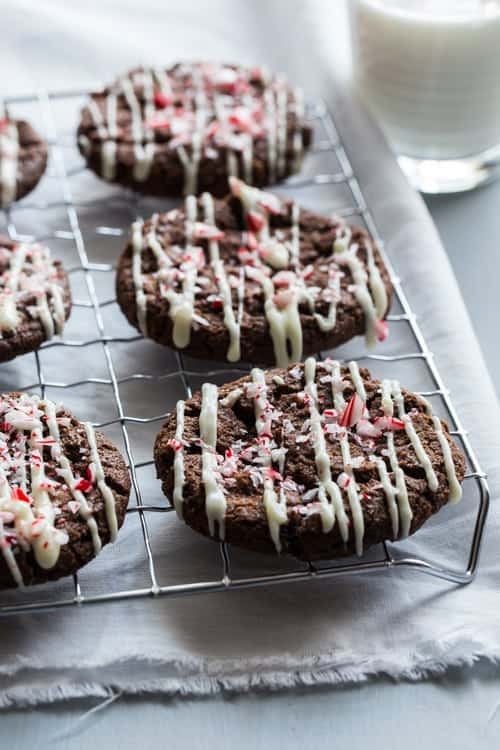 Use a spoon or piping bag to drizzle the melted candy wafers over the cookies, immediately sprinkle with crushed peppermint candy canes. Ha. I’m with you. Had this grand idea of doing all of this baking and then reality set in. Gotta pair it down. But I do think these cookies are going to have to go on my list – they look ridiculously good! This recipe is exactly what I need. 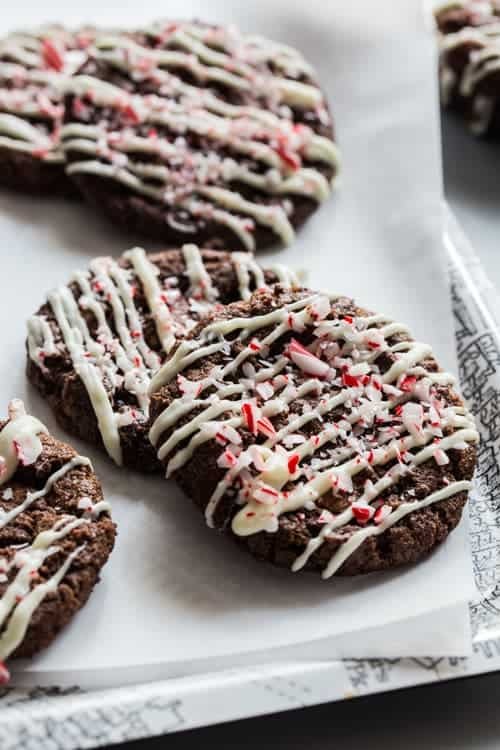 Chocolate and peppermint are heavenly together. I have everything but the candy canes. (confession…no candy canes in the house eeek!) However I have some Andes Peppermint Crunch bits that I can use. I’ll let you know how they turn out. Thank you for your beautiful blog and all that you do to inspire and connect with your readers. How you do what you do with a lively 11 month old is impressive to say the least! I’ve been a passionate baker for over thirty years and I have gained new excitement for our addiction thanks to you. The recipes are perfectly written, the photography is crazy good and your descriptives are heartfelt and smart. May the holidays be nothing but fun for you and your family. Thank you so much for your kind words. I am so glad you enjoy the site and I wish you the happiest of holidays! I just finished making these and they are delicious. The ghiradelli bittersweet chips stayed melty inside this brownie like chewy cookie. They can surely stand on their own without the drizzle and peppermint. But, oh boy!!! I used white chocolate chips and a bit of shortening to make the drizzle and topped that with Andes Peppermint Crunch chips. They are delicious!! I love this easy to make recipe and will surely make them again.. Thanks for sharing! I’m so happy that you enjoyed the recipe! Thanks so much for stopping by and Happy Holidays! Jamie, wouldn’t it be better to put the crushed peppermint chips on the cookies while still warm from the oven so that they sink in? If they aren’t put on until the cookies are completely cool, they will not adhere and could fall off. Yes, the white frosting could help but the photo shows the frosting UNDER the peppermint chips. Yummy, this is like a peppermint mocha in cookie form! I wouldn’t mind smelling this deliciousness in my kitchen all day! Oh my gosh, Here it is still September, and I am planning my Christmas sweets! So hopefully I am this organized when the time comes that everything that should be done by then gets done. I love this cookie and will be trying it out. I have made similar cookies to this and they stand out beautifully on a plate of goodies! Thanks so much for stopping by, Carol! I appreciate you taking the time to comment. Happy Baking!